Sew Festive Handmade: Sewing for me! After all the sewing I've been doing for various obligations I decided it was about time to do some things just for me. 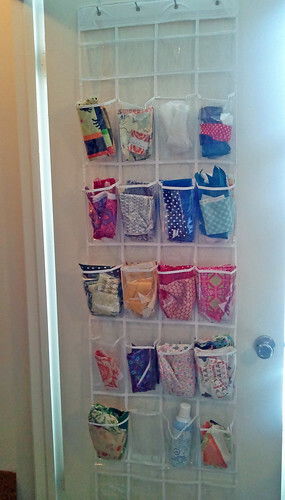 I bought an over-the-door shoe rack and put it in the closet of my sewing room. The scraps are sorted by color, voile scraps, interfacing, holiday, and orphan quilt blocks. If you couldn't be a tester but want the patterns, look for them for purchase at the beginning of August! 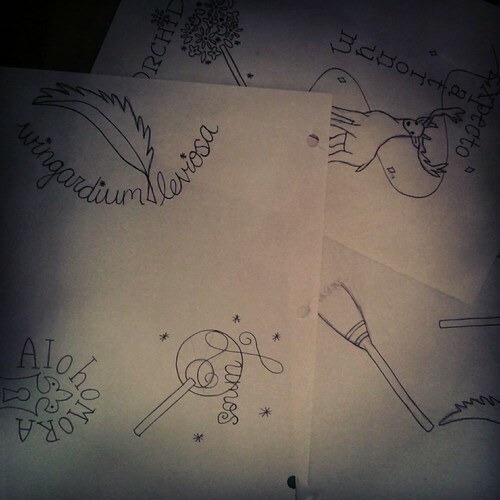 I have 6 spell patterns and a set of 3 Quidditch-themed mini patterns. So I need 7 pattern testers. 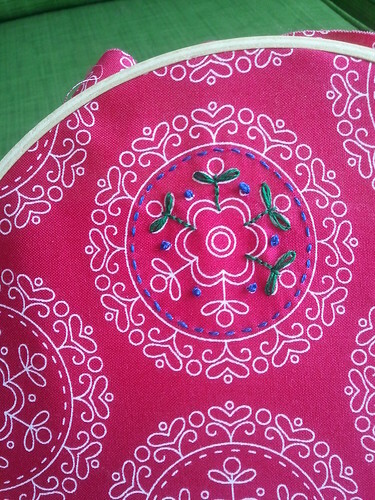 You can be a brand-new embroiderer or someone who can stitch in their sleep. I will let you pick the pattern you'd like to test on a first-come, first-serve basis. I would really like if you could get it stitched up within 2 weeks of receiving the pattern from me [which will be Sunday night or Monday because I'm having problems getting them to print to scale], as they are small designs so they shouldn't take you too long. If you'd like to be a tester, just send me an email by clicking the Gmail button on the right sidebar. Please include what level embroiderer you are. I'll reply with the pertinent information! And finally, I got some Lecien fabric that is PERFECT for more hand-stitching, so I worked on that while I watched Friends last night. If I could have somehow eaten ice cream at the same time then life would have been perfect. I have absolutely no idea what the finished product might be, but I want to make a conscious effort to be more consistent in my stitching. I can do French Knots and a lazy daisy stitch just fine, but I'd like to get to the point where they're all the same size! Kind of like my very own back-to-basics camp? *Linked to the Handmade Parade at There and Back - go link up if you've got some handwork! Yay! I'm so glad you got some time for fun just for you! And embroidery patterns? what can't you do!! They're adorable. I'd buy them. I hope you get to move forward with them! count me in, steve's a big dork so he'd totally eat these up! (I'm a big dork too, but don't want to admit it) - super cute idea! Look forward to seeing your embroidery designs stitched up. Sorry, couldn't spell embroiderer! 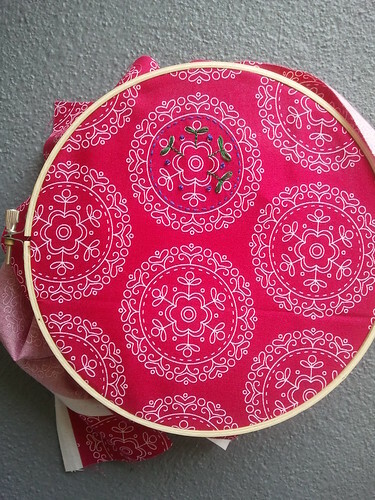 I am only a novice embroiderer but would love to test your patterns, they look great! I am interested in helping you out and doing some embroidery. :) I am trying to get a HP mug rug swap started :) I could not get to the e-mail form to contact you. Can you get to me? Well done! The HP embroidery patterns are super cute! Looking forward to seeing your embroidery work as it progresses, beautiful stitching, by the way. Can I just say, you're doing a fantastic job on Christmas in July? <3 Also, that shoe hangar idea... genius. Can I have your brain? HP projects? "always"... okay that was a bad joke. Sorry. I just decided it was high time I re-watch Friends again, so I've worked my way through season 1 this week. My hubby thinks I'm crazy cause I laugh just as hard every time, but it never gets old to me! Wonderful idea! 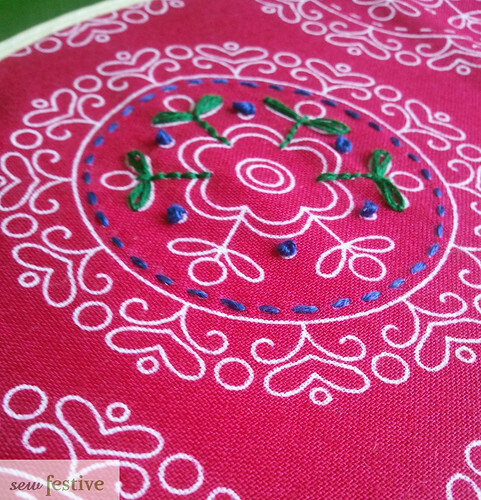 I love the hand embroidery on the Lecien fabric. I can't believe I never thought of this :) Great way to practice!